Maps of study area. Modern oxygen concentrations in μmol/kg with the locations of Pacific records of bottom water oxygen as recorded by aU from ML1208-17PC (this study) (diamond), RC11-238 and RC13-140 (dots), TT013-PC7237 (square), ODP 849 and MD97-2138 (inverted triangles) (a). The lower panel shows modern Δ14C-concentrations with radiocarbon from TTN013-18 (open triangle), and GS7202-15, PLDS 7G, VNTR01 10 GC, KNR73 3PC, KNR73 4PC, KNR73 6PG and S67 15FFC (open circles). Basemaps made using Ocean Data View. As the largest reservoir of carbon exchanging with the atmosphere on glacial-interglacial timescales, the deep ocean has been implicated as the likely location of carbon sequestration during Pleistocene glaciations. Despite strong theoretical underpinning for this expectation, radiocarbon data on watermass ventilation ages are conflicting, and proxy interpretations disagree about the depth, origin and even existence of the respired carbon pool. Because any change in the storage of respiratory carbon is accompanied by corresponding changes in dissolved oxygen concentrations, proxy data reflecting oxygenation are of value in addressing these apparent inconsistencies. We present a record of redox-sensitive uranium from the central equatorial Pacific to identify intervals associated with respiratory carbon storage over the past 350 kyr and find evidence for repeated carbon storage over the last three glacial cycles. 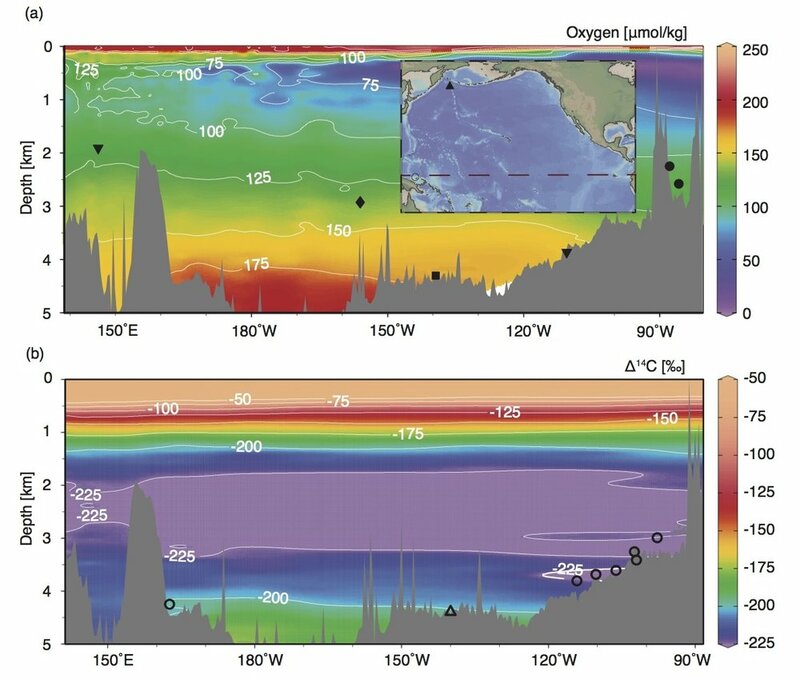 We also synthesize our data with previous work and propose an internally consistent picture of glacial carbon storage and equatorial Pacific watermass structure.